Bold colors and designs are just what you're going to get when you shop online for EJ Samuel high fashion suits. With their use of unique looking suit fabrics and fashion looks, these are the suits for men who favor stylish attire. 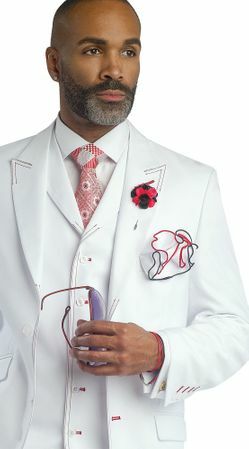 This bold white with red fancy stitch detail 3 piece suit features a full cut with a fancy looking single breasted vest with lapels and pleated pants. Made of super 150s poly/rayon with a nice wool feel. You can add some new Mens Blazers to your wardrobe and really improve your style dramatically.